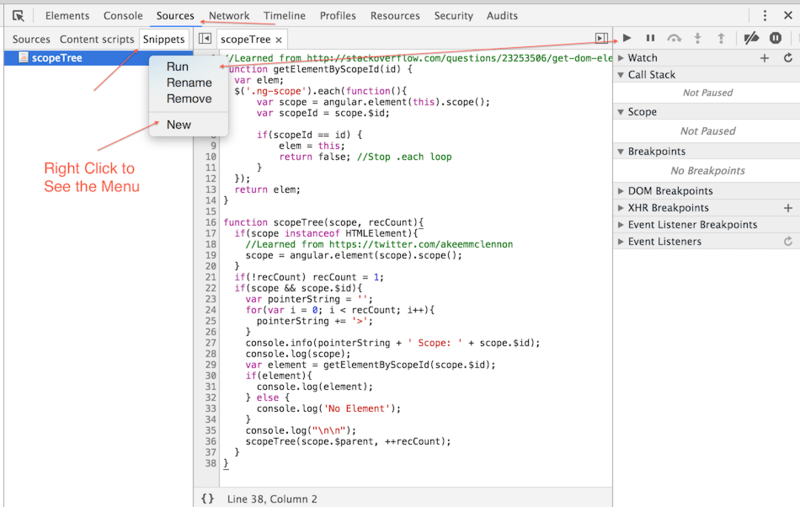 Copy paste the script bellow into your Chrome Dev Tools console or add it to a snippet. You can learn more about Google Chrome Dev Tools Snippets here. Select element for which you want to debug the nested scope. Run scopeTree($0) in your console to see the element, all the parent elements and their scope. Copying and pasting the script into console is fine to test things out, but it could get annoying if you want to use it often. Luckily, Chrome Dev Tools has a cool and not very well know feature called “Snippets”. Make new snippet (See image above). Name it “scopeTree” or anything else you’d like. Copy paste above code into the snippet. 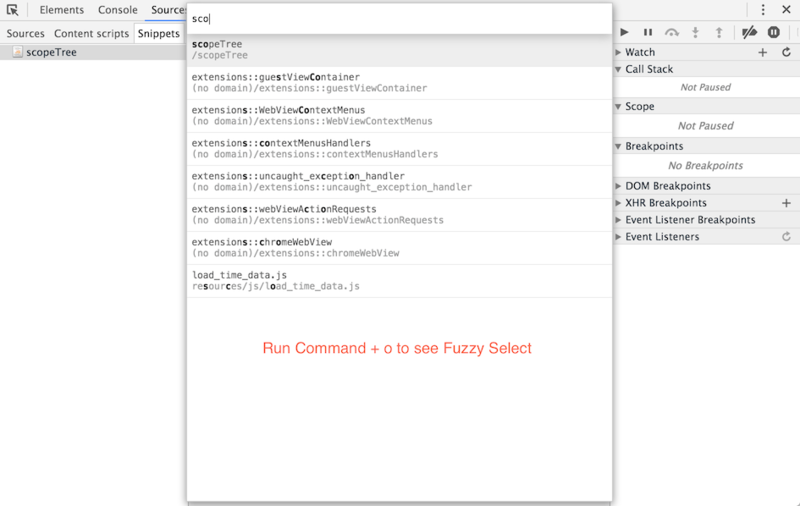 Open the snippet via a fuzzy select. Run Command + o (Ctrl + o on Windows) see the image bellow. Run the snippet by hitting Command + Enter (Ctrl + Enter on Windows). Select the element for which you want to debug the nested scope. Enter scopeTree($0) in the console. There were 2 tricks that helped me to put this thing together. I learned this form a co-worker of mine @akeemmclennon. In Chrome Dev Tools you can reference the last selected element via $0. Then you can get the angular scope for the selected element via: angular.element($0).scope(). As you recall we call our function with scopeTree($0), and use that to get the actual Angular element and it’s scope. Chances are you are using AngularJS Batarang for your development (if not, check it out). It already provides similar functionality, by exposing the $scope variable (just console log $scope after selecting an element) which is identical to running $scope = angular.element($0).scope() in your console. You can actually use the Batarang’s $scope variable instead of the $0 with scopeTree($scope) function, if you so prefer. As you probably know, in Angular every $scope maintains a reference to a parent scope aka $scope.$parent. But I wasn’t sure if you could actually get the DOM element by specifying scope id. Which led me to this piece of code. Once I could get the scope for selected element, and it’s parent element via it parent element scope id, it was just a matter of recursively going up the parent tree, until the root node is found. This allowed me to console log every element and it scope, which (in my opinion) provides for a very nice debugging experience. Why don’t you just use the Batarang’s nested scope view? Batarang does have a nested scope view, but I could never make it work for me. It just seemed too hard to visualize the scopes and elements that they were associated with. In addition, the expanded scope view that list all of scope’s parameters and methods was just too long and hard to look through. I prefer hovering over an element to see it highlighted in the web-page, as well as inspecting the scope object in Chrome Dev tools console. Cool stuff, thanks! One note: your code snippet looks like it was HTML-escaped, as it has & , < and >. Tripped me up for a sec before I caught it. Works great, thanks for posting this! Thank you! It was a mark down conversion error and I didn’t catch it.